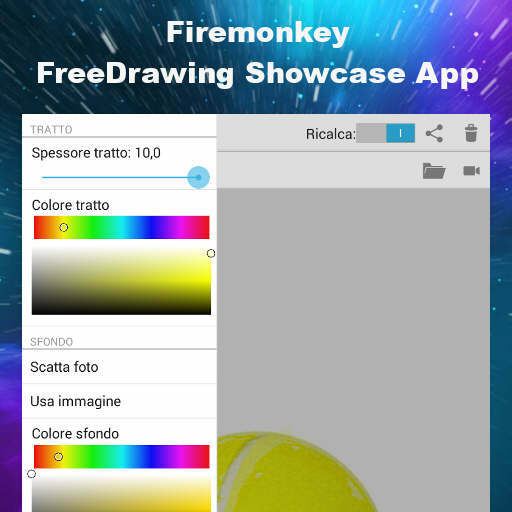 Developer Andrea Magni from Italy has a drawing app on Android which showcases some of the new features of Delphi XE7 Firemonkey. The original app was built using a previous version of Delphi and has been upgraded to Delphi XE7. The app uses the new multitouch support that is available in Delphi XE7 Firemonkey which allows you to draw with multiple fingers at the same time. It also implements the TMultiView component which simplifies building apps for multiple screen sizes. The TMultiView component restructures itself depending on if you are on a phone or a tablet automatically (you can see it in the screenshot). Also demonstrated in the app is the new built in Delphi XE7 Firemonkey splash screen on Android (in previous versions you had to build your own). Lastly it demonstrates the new Fullscreen feature available in Android KitKat which allows you to hide the navigation buttons of the device and truely use the entire screen for your app. The latest version of the app is currently available from Google Play (the older version is available on the Apple App Store). The new functionality demonstrated in the app is also available in Appmethod. If you want to build your own drawing app in Delphi XE7 Firemonkey there is a demo with source code available here. Head over and check out the full blog post about all of the new features implemented in the FreeDrawing Delphi XE7 Firemonkey showcase app. Or download the FreeDrawing showcase app for yourself directly from Google Play.